These pulled pork tacos with cilantro lime aioli are perfect for dinner any night but will make your 5th of May a little bit more celebratory. I love a good taco and after eating at Taco Republic I started craving a delicious combination wrapped in a corn tortilla. In an effort to make my own version at home I came up with this recipe and I’m totally in love. Can you believe its May this week? I swear, where do the months go?! You know what that means, right? Cinco de Mayo is right around the corner and you’ll need to whip up something festive for your family and friends. 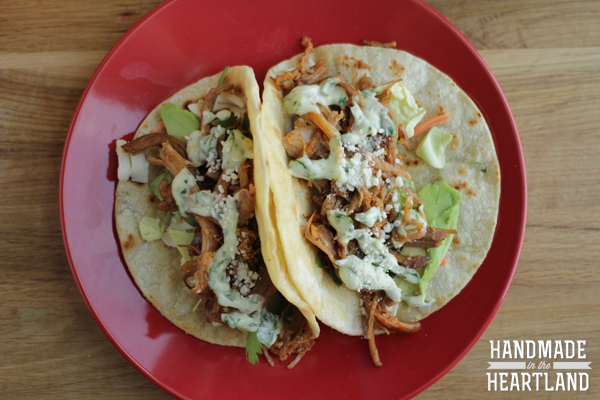 Give these pork tacos a try, you won’t regret it! 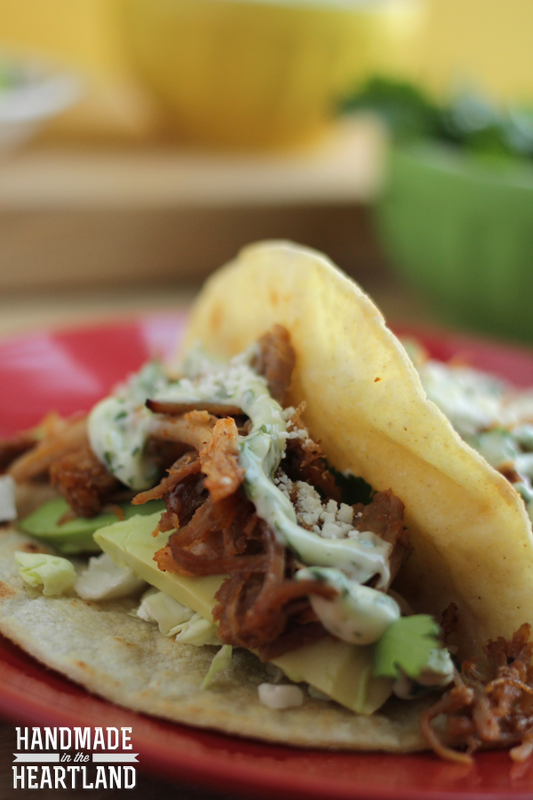 Make up a big batch of my slow cooker pulled pork for these delicious pork tacos. I love to serve this with my favorite Mexican corn salad, you can eat it on the side or in the taco, yum! 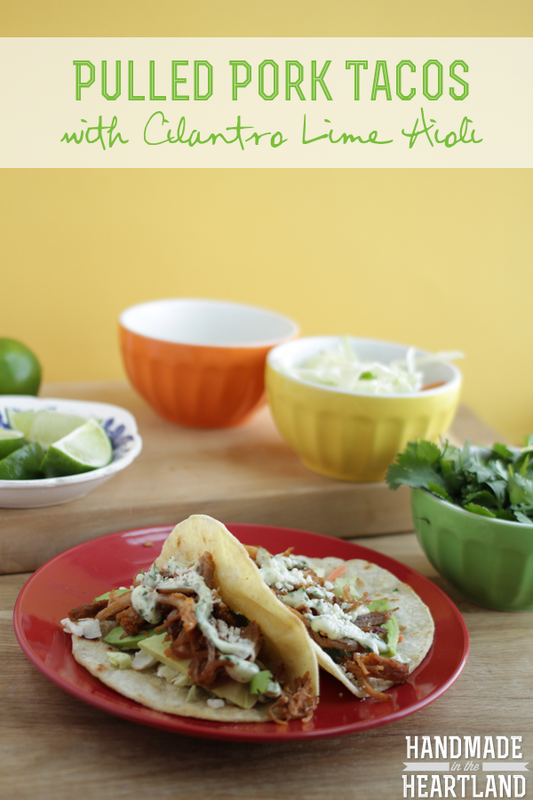 The cilantro lime aioli throws these tacos into the “I want more” category, literally so good! 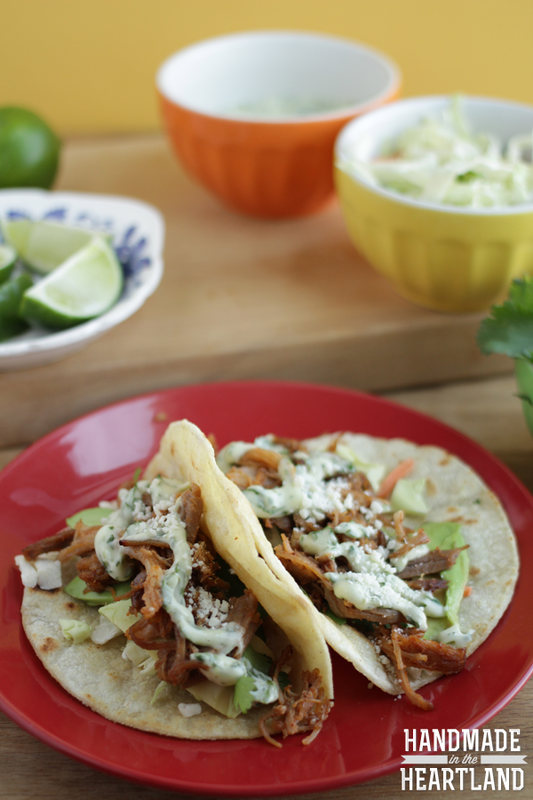 These pulled pork tacos are easy to throw together with slow-cooked pork, the cilantro lime aioli is a delicious topping! 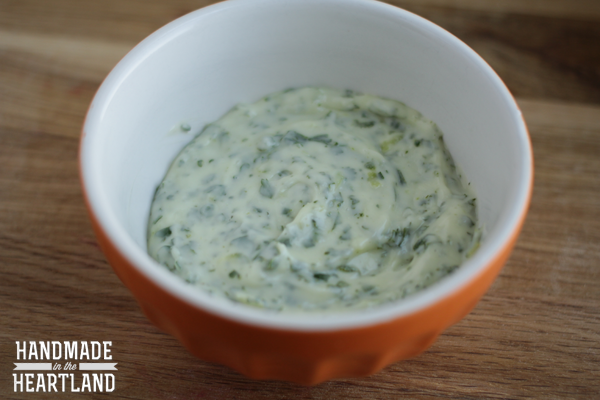 To make the aioli place 2 tablespoons of cilatro, zest of 1 lime, juice of 1/2 a lime and 1/2 cup of mayo in a food processor or blender. Or chop the cilantro and mix all ingredients together. I like to crisp up the toritllas a little bit, to do so heat a saute pan over medium heat, spray with cooking spray then place the tortillas on the pan- saute each side for a few minutes, until lightly browned in spots. To make the taco place slices of avocado and shredded lettuce on the taco, pile high with pulled pork and then top with a little bit of cotija cheese, aioli and extra cilantro and lime juice if desired. Enjoy! If you make this recipe please share it with me! I’d love to hear in the comments or tag me on Instagram (@handmadeintheheartland) or Facebook! 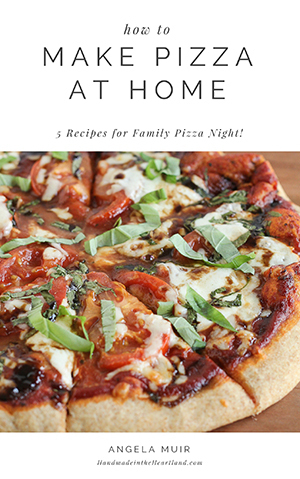 It makes me so happy to see you using recipes from the blog! Isn’t pulled pork so versatile? I love a great pulled pork sandwich but this is the perfect “leftover” meal a few days after you eat BBQ sandwiches. It feels like a new meal but the item that takes the longest is already prepared! This is also an easy party food, you can create a make your own taco bar by placing all the ingredients in small dishes & bowls and leaving the meat in the crock-pot. Enjoy it friends! Are you celebrating Cinco de Mayo? Let me know how in the comments! This post contains affiliate links. An affiliate link means that I make a percentage of the sale if you click over and buy the item I recommend with no extra charge to you.